It is important not to be over-optimistic about how quickly you can achieve your objectives. For a new build, although the actual construction may take only 12 to 18 months, there are a great many preparatory tasks which have to be completed before the builders can go on site. It is not unusual for this development period to be in the order of 3-5 years. Securing a site and getting planning permission can be especially lengthy aspects. 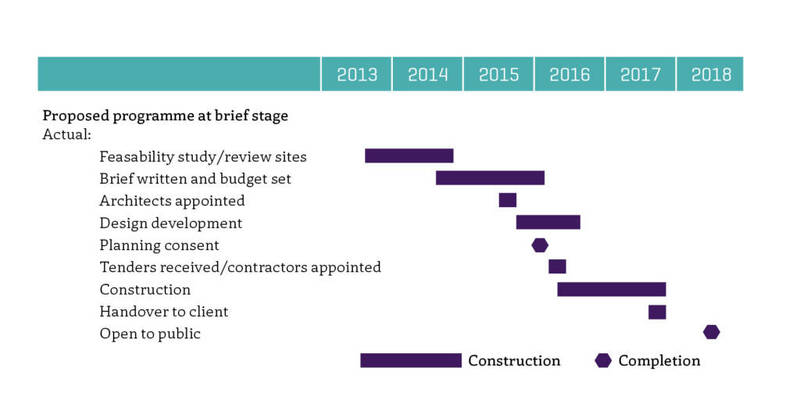 Below is a typical programme for a new build development. As you can see, the schedule slipped against the original completion target date, and this is far from uncommon. For refurbishments and conversions, clearly the timescale should be much less. It may be possible to gain access to the building relatively swiftly, but don’t forget that unless you are in the happy position of owning the freehold, you will need to cover your rent somehow until such time as you get paying customers through the door. An options appraisal is a systematic examination of the range of options available to meet your objectives. This is pre-feasibility work and strictly speaking should be done right at the beginning of the process. In practice of course, most people will already have decided they want a cinema and much of what they propose will have been dictated by the physical constraints of the building. However, it can be a very useful tool in making you think more creatively about possible solutions. Having identified the range of options, each one is evaluated against criteria which are then weighted according to their relative importance. A sample options appraisal is contained in Appendix 1. Some current management thinkers now suggest the business environment is changing so rapidly that it is in fact not possible to plan even two years ahead, let alone 5. Instead, they propose ‘scenario planning’ which looks ahead at possible changes to the operating environment, its impact on the organisation and possible responses. However, this does not obviate the need for a written document. A good business plan is not just a tool for raising finance, it is a ‘live’ document which provides the baseline against which you can measure your performance and should be revisited and updated on a regular basis. Planning is an iterative process and this should be reflected in the way you use your plan. Benchmarking is a way of comparing the feasibility of your plans and forecasts against the operation of existing cinemas. The key to this technique is making appropriate comparisons with existing venues, and having access to accurate information covering several years. The main resource for statistics in the UK is the BFI. The research department at the BFI provide data and market intelligence on the UK film industry and film culture. They compile the BFI Statistical Yearbook and weekend box office figures. The tool that most theatrical venues (about 90% of the market) use for their box office reporting is Rentrak’s international box office service, this uses real-time reporting technology. Most theatrical distributors use this system to access weekend box office results, historical box office data and perform film analysis. You need an account with Rentrak to use their services. By looking at the performance history of other cinemas it’s possible to arrive at a more accurate estimate of the potential for your cinema and an understanding of audience patterns and the balance of factors involved in developing audiences for cinema. Benchmarking is a good method of better understanding the operational contexts for a new cinema, and especially gauging the accuracy of costs and revenue forecasts. There is also an aspirational element to comparing a new venue to an established cinema with a strong track record. Provided that the correct comparisons are being made, this element can be important in expressing the direction and ambitions for a new venue to funding bodies and stakeholders. It sits alongside competitor analysis in the business plan, in providing a more rounded picture of the size of the market for a new cinema. A sensitivity analysis is simply a way of exploring what would happen if some of the assumptions you have made in the business plan turn out to be wrong. For example, if you have based your revenue forecasts on the assumption of 20% average occupancy, you might want to explore what would happen if you only achieved 15% or conversely if you did better than expected and achieved 25%. You could also try out the effect of adjusting ticket prices, film rental percentages or any other ‘unknown’ costs. This exercise is easy to accomplish using a computerised spreadsheet which incorporates formulae and variables which you can adjust. You can also use this method to establish your break-even point i.e. the critical level of turnover at which you make neither a profit nor a loss. Some funding bodies/financiers will want to see sensitivity analyses incorporated into the business plan and it is also a useful tool when conducting a risk assessment (see below). A sample sensitivity analysis is contained in Appendix 2. Buildings-based projects can be time consuming and expensive and many funding bodies and financiers require an assessment of risk to be made before they will invest in the scheme. This can be a useful thing to do for any project. In essence, it involves identifying everything that might possibly go wrong (or not to plan), its impact on the project and actions that can be taken to mitigate against them. A sample risk assessment is shown in Appendix 3. Don’t underestimate the time required to get this type of project off the ground. Be prepared for overruns, especially if builders and public funding agencies are involved – your project isn’t the only one they will be working with. Before you launch in, make an objective assessment of all your options. Are there other (cheaper, easier) ways to achieve your objectives? A business plan is an essential tool, not only for raising finance but also for evaluating progress and performance. Revisit your assumptions and figures on a regular basis. Sensitivity analysis asks the question ‘what if?’. Don’t be afraid to explore the unthinkable…better to do it now in your imagination on your computer than to unexpectedly face the real life scenario. Look at the risks associated with your plans. How likely are they to happen? What would you do if they did?